1. 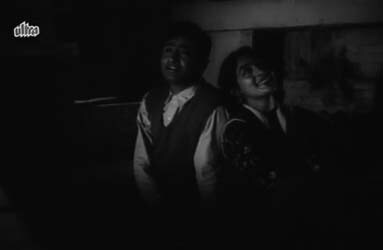 Gumsum sa yeh jahaan yet raat yeh hawa (Duniya Jhukti Hai, 1960; with Hemant Kumar): There’s something about the voices of Geeta Dutt and Hemant which makes them fit very well together—the slightly nasal quality (more pronounced in Hemant than in Geeta Dutt), perhaps a certain intonation of some words. Whatever; individually, they’re among my top favourite singers, and together they’re unbeatable. In this beautifully romantic song (in a film that was, sadly, nothing to write home about), Geeta and Hemant are superb. The music is so melodious, and their voices are so perfectly matched. This is one of those songs I can listen to in a loop. 2. Mujhko tum jo mile yeh jahaan mil gaya (Detective, 1958; with Hemant Kumar): Another pair of lovers meeting in the night. Another song in the voices of Hemant and Geeta Dutt. This one, though, with music composed by Geeta’s brother Mukul Roy, is rather different from Gumsum sa yeh jahaan: it’s softer, quieter, more gentle. 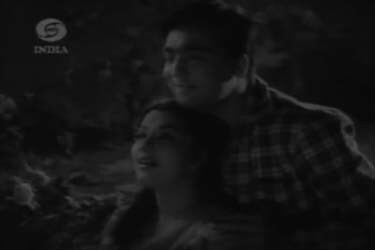 And the combination of Hemant’s gorgeously deep and rich baritone, and Geeta’s sweet soprano: one of the best romantic songs there is. 3. 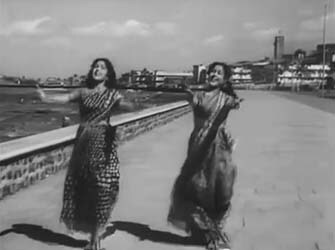 Na main dhan chaahoon (Kaala Bazaar, 1960; with Sudha Malhotra): For a change from the romance of the two previous songs, a bhajan. I am not a fan of bhajans, and the number of Hindi film bhajans that I like is so few and far between, I’d be hard-pressed to find ten to compile a list. But Na main dhan chaahoon is an exception: this is a poignant, very well-put-together bhajan. The picturisation is excellent, the lyrics very relevant (and not merely just another hymn in praise of an omnipotent deity). And, best of all: the music and the two voices. 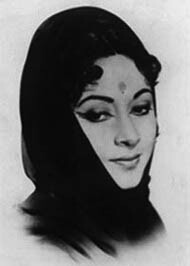 I have always been enthralled by SD Burman’s ability to choose just the right voices to match actors, and this is no different: Sudha Malhotra’s girlish, rather more conventional voice is perfectly suited to a young Nanda, while Geeta Dutt’s more mature voice fits Leela Chitnis to a T. The way they echo each other, joining, going one before the other, and then coming together again: beautiful. 4. 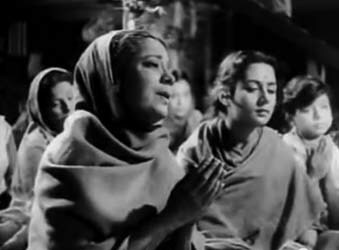 Kya ho phir jo din rangeela ho (Nau Do Gyarah, 1957; with Asha Bhonsle): Another song in which Geeta Dutt is paired with a female singer, but a song that’s worlds apart from the quiet, self-effacing devotion of Na main dhan chaahoon. 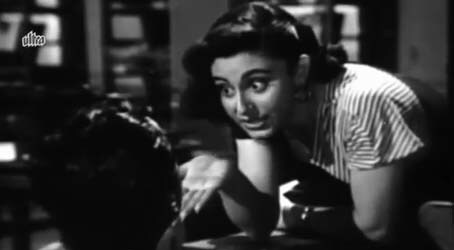 Kya ho phir jo din rangeela ho is a club song—one of SD Burman’s best—with Asha singing playback for a young and effervescent Helen, while Geeta Dutt sings for a more sensuous, cigarette-holding Shashikala. Again, the two voices are matched beautifully to their respective characters: Shashikala is the vamp, the self-assured, confident woman out to nab the hero and his money. She’s the main dancer in the nightclub, so the sultry smokiness of Geeta Dutt’s voice is a perfect fit for her, as is the definitely slower, softer, almost slurred tempo of the lyrics she sings. 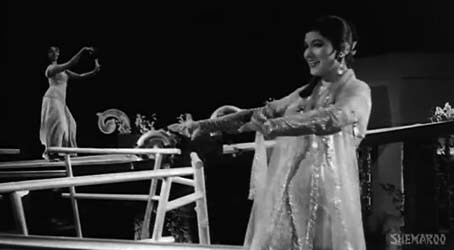 Helen, on the other hand, is in a cameo, a dancer who appears just in this one song, to provide the faster, peppier contrast to Shashikala’s singing. 5. Chupke se mile pyaase-pyaase (Manzil, 1960; with Mohammad Rafi): The first time I heard this song (I was watching Manzil, which was being shown on Doordarshan), I started off being none too impressed. Recited poetry as part of a song isn’t unknown, even if it’s unusual, but I’m not especially fond of it—and this song just seemed to meander, less a song than lyrics being read… and then, gradually, it began to sparkle, to become a stunning piece of singing. 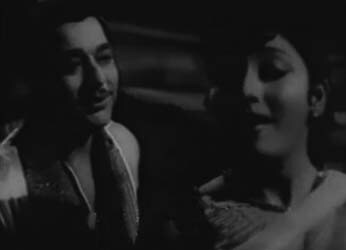 I love the way Rafi’s and Geeta Dutt’s voices come together in Chupke se mile pyaase-pyaase: not singing together, but complementing each other, singing in parts, or one singing and one humming. Sublime. 7. Tum jo hue mere humsafar (12 o’Clock, 1958; with Mohammad Rafi): Among the male singers with whom she was paired, Geeta Dutt sang some of her best songs with Rafi. Whether it was purely romantic songs like Chupke se mile pyaase-pyaase, or philosophical-in-a-lighter-vein ones like Ae dil hai mushkil jeena yahaan, these two, thanks to their versatility and their wonderful voices, managed to infuse each song with all the right emotions. Tum jo hue mere humsafar is an airy, sweet love song: tuneful and pleasant, and very easy listening. This, incidentally, was probably the very first Geeta Dutt duet I remember hearing in which I was able to identify her voice. 8. Jaane kahaan mera jigar gaya ji (Mr & Mrs 55, 1955; with Mohammad Rafi): Mr & Mrs 55 allowed Geeta Dutt to shine in some great songs, all the way from solos like Thandi hawa kaali ghata aa hi gayi jhoomke and the poignant Preetam aan milo, to duets like Chal diye bandanawaaz to the utterly romantic Udhar tum haseen ho—and this one, a delightful little song about being in love but not letting that come in the way of being comical. Rafi, who was—as is evident in so many songs with Johnny Walker—the ebullient, appropriately nutty voice of the comedian; Geeta Dutt here shows that she can hold her own as the voice of Yasmin, who plays Johnny Walker’s playful and mischievous girlfriend in Mr & Mrs 55. A song that sounds happy and frothy and fun. 9. 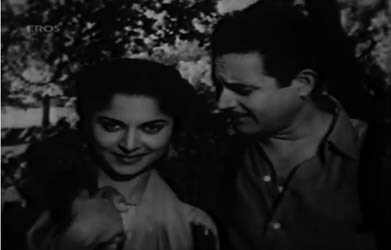 Sun sun sun zaalima (Aar Paar, 1954): Aar Paar had a song—Arre na na na tauba tauba—which, besides being also sung by Geeta Dutt and Mohammad Rafi, was very similar in tone to Jaane kahaan mera jigar gaya ji: ardent suitor woos his lady love, and though she does love him, she tries, deliberately and teasingly, to quash his fervour. And there was this song, very well-picturised in a garage, with hero and heroine waltzing all across cars, on roofs and hoods and past equipment. Sun sun sun zaalima had a sad, solo version, but this fast-paced one is a lively, effervescent one that’s hard not to like. 10. 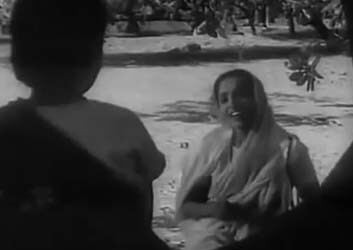 Hum panchhi mastaane (Dekh Kabira Roya, 1957): Geeta Dutt sang some of the nicest saheli songs there are—like Jaanu jaanu re kaahe khanke hai tora kangna, Akhiyaan bhool gayi hain sona, Thandi-thandi hawa poochhe unka pata—and this vivacious, carefree little number from Dekh Kabira Roya. Lata Mangeshkar and Geeta Dutt sang together in nearly 40 songs (from what I’ve been able to gather), many of them from fairly obscure films. This one, though, is a relatively well-known song, and from a score which included some huge hits. Lata and Geeta are pitch-perfect, emotion-perfect, here: bubbly and frothy and determined. So, which are your favourite Geeta Dutt duets? Great selection of Geeta Dutt duets – particularly the duets with Hemant Kumar and other female singers which are not so often heard. It was really nice to rediscover “Chupke se mile…”. It is an outstanding song, with Geeta and Rafi truly complementing each other, as you say. One perennial favourite I’d like to mention is this Geeta – Rafi duet from CID. The unusual thing about it is that Rafi only sings the two lines (the so-called mukhda) repeatedly while the bulk of the singing is done by Geeta Dutt. I have very fond memories of CID and especially of Aankhon hi aankhon mein ishaara ho gaya, because this was the very first Hindi film I remember having seen ever – and this song (more even than Boojh mera kya naam re, which comes earlier in the film) is my earliest memory of seeing a song. Lovely one. No other Hindi film song has captured a rain-swept Marine Drive like this one. The picturisation is evidence of Vijay Anand’s talent early in his career. Vijay Anand was brilliant, even very early in his career, wasn’t he? I am all admiration for him whenever I see Nau Do Gyarah – so well-made. And I think he was only about 24 (younger?) when he made it. Yes, Nau Do Gyarah was very stylish and confident for a first film. I think of it as the first ‘road movie’ in Hindi cinema. The first half of the movie, with its great songs and terrific chemistry between Dev Anand and Kalpana Kartik, is so watchable. I had a discussion about the concept of ‘road movies’ in Hindi cinema, with an author of cinema writing, some months back. He specifically didn’t think Nau Do Gyaarah was a road movie, for the simple fact that the travelling actually doesn’t take up even half the movie. In my opinion, the first actual road movie in Hindi cinema was Chori Chori, though if you make a stretch and extend the term to films that were about travelling (not necessarily by road), then I thought Sagaai would’ve fit. Some Geeta-Asha duets on the list already, but nevertheless, may I proffer Janu Janu Ri from Insaan Jaag Utha (1960)? 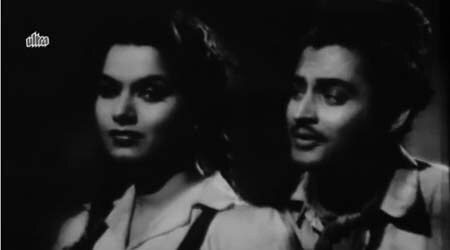 One of my favourite songs of all times – the chemistry between the singers, or for that matter the two actors (Madhubala and Meenu Mumtaz) is just luscious IMO. Whoops! I notice the post carries a mention of it. Hadn’t seen it earlier. No problem. :-) I like Jaanu jaanu ri very much, so am glad you actually posted the link here. A lovely song. It was on my shortlist, and I nearly posted it – dropped it at the last minute in favour of Hum panchhi mastaane. You’ve got some of my really really loved songs in your list. Just saying I love them seems inadequate. gumsum sa ye jahan, mujhko tumjo mile, tum jo hue mere humsafar and chupke se mile pyase pyase. These are also my all time favourites. Geeta solos and duets belong to the category where they mostly tend to turn out fantastic. I watched this film about a couple of moths ago. And oh, yes, I love Thandi thandi hawa poochhe unka pata too! Lovely song; I was wishing I’d seen the film so I could’ve put it into this list. What’s the film like? Typical Johnny Walker-as-hero type? The others I’ve seen in which he’s been the hero (Chhoomantar and Khota Paisa) haven’t been too great. Not terrible, but not memorable, either – though the music in both was good. There was too much of Johny Walker in the film Johny Walker IMO. Normally he comes as a relief but here there was no relief from him. His dialogues were endless, not his fault of course, and this monologue was annoying. The film had a message and could have done a better job with it. But the songs are all lovely so is Shyama. But just for Shyama and the songs… I think I could probably sit through it, too. And I have sat through some perfectly horrendous films (Suhaagan, Parivaar, etc), which didn’t even have good music to balance them out – so this one should be fine. I don’t remember when I watched Manzil, but I do recall that the only two Dev Anand-Nutan films I’d seen prior to it were Paying Guest and Tere Ghar ke Saamne, so my expectations were very high! And I was pretty disappointed in this film. Oh, yes. De bhi chuke hum dil nazraana did cross my mind, but I don’t like it much. Geeta Dutt Duets! I didn’t think they would come up so soon, Thus, was delighted to see this list. What a fabulous selection of songs you’ve listed! I like all of them! I can just imagine the pains you must have gone through while removing songs from your list. I hate that myself very much. There are so many good Geeta Dutt duets, that it is a hard task to choose from them. That is why I’ll list few songs with her duet-partners, who don’t appear on your list. Never thought that there would be Geeta Dutt duet with Ashok Kumar! Wah, harvey! What a selection! I must admit that of all the songs you’ve listed, the only ones which I remember easily without having to listen to them are Khayaalon mein kisi ke (which I love) and Aankhon mein tum (which was on my shortlist). I’ve also heard Thandi hawaaon mein. The others… I will listen to them through the day and tell you what I think. (I’m pretty sure they’ll all turn out to be at least pleasant – I can’t think of too many songs from the 50s and 60s which were downright awful to listen to. A song from that era may not be outstanding, but the chances of it being horrid were very slim). Thank you! I agree! Exactly the opposite is true for the 80s. True! The 80s were horrible! VOW! Is there any other singer whose name is missing in the list? Yesterday night I could go through your post on Geeta Dutt’s duets and listen to the songs. I thought of mentioning the songs that I liked the most and like Pacifist could not leave out any. Thanks for the delightful duets. I was feeling a bit fatigued and so I decided to put my comments, along with a few songs I had in mind, today. But I found Harveypam has mentioned all the songs that were also my favourites. Thanks to Harveypam. I would like to add a Geeta-Lata duet from Surjamukhi. Dil unse kehte darta hai was new to me, Venkataramanji! Thank you for that. Lovely song. How could I have forgotten that Tumse hi meri zindagi was a Geeta Dutt song?! Thank you for reminding me of this – I love this one. I love this discussion. I accidentally landed here as I was reviewing Sathya Saran’s book Sun mere Bandhu Re. I loved many parts of the book though I agree with you in some areas but that discussion is for another day. First of all, a big thanks to you for providing such an excellent source for information on movies and books. Not to sound Cliche, I feel like a kid in candy store when reading these discussions. These are all so close to my heart. I love the passion you have for this era (I mean songs before seventies) and the language you use when describing the songs. I am a huge Geeta and Rafi fan (and to some extent of Lata as well). Your list includes two of my personal favorite Rafi-Geeta songs (Chupke se mile and Tum Jo Huwe Mere Hamsafar) which I didn’t think were so popular (for reasons unknown). Anyway, the song I want to bring to your attention is nothing spectacular and I don’t think I liked it very much when I heard it for the first time but it grew on me as I hear it more often. The song is “Ta Thaiya Karte Aana, O jadugar more sainya” from the movie Panchayat, by Geeta and Lata. The lyrics are OK (usually I need lyrics to be top class for me to like a song), the music is not bad but what I love about this song is how Geeta, with her honey drenched voice, with the same tune and lyrics (as Lata) sound so much more sweet to the ears than the genius Lata. I am sorry, I don’t intend to start a discussion about comparing any two artists because I think that is such a waste of time since it is not a zero sum game. You certainly don’t have to married to just one artist (you can, but you don’t have to). Sorry, I digressed. All I am saying is that this song made me realize how clearly the beauty of Geeta’s voice shines through this not-so-spectacular song. I love her voice and love this song for that reason. Don’t know if my link paste will work but here it is. Do let me know what you think of this song! And yes, I am very familiar with Ta thhaiyya karke aana: I love that song, though the lyrics always puzzle me (I can imagine her lover coming along doing Bharatnatyam…) A wonderful song, and one which I’d have probably included in this list, if I’d watched Panchayat. Thanks for putting it in! Ha! That’s the exact puzzling visual I get as your comment “I can imagine her lover coming along doing Bharatnatyam”. That song, to me is mostly for the music and not so much for the lyrics. Generally speaking, I like only the audio parts of movie songs because I find the visuals fall short to justify the amazing beauty of our music, but that’s just my opinion. Of course there are exceptions such as Chupke se Mile Pyase Pyase.. Actually that song is special for many reasons.. One to hear Geeta talk ever so softly just as melodious as her singing voice, second, the perfect harmony that Rafi and Geeta bring to the fore complementing each other with flowing music, third the intoxicating lyrics.. I can go on and on..
Lovely post, Madhu (‘What’s new?’, she asks rhetorically.) and lovely selection of songs. Don’t have the time to luxuriate in listening to your selections, or to add any of my own, but thank you for this. Nice! Richard, I think, had posted a song from Lukochori on Facebook the other day. Not this, though. i want to post one more song to add to the list. this song is worth listening. P.S. A request. When you post a song, could you please write the name of the song in your comment? Videos have a tendency to disappear very abruptly from Youtube, so if somebody reads your comment a few weeks from now, if the video has gone off Youtube, they won’t know which song you’re referring to. but for a change we have mahipal in a social film, and not in mythological or costume drama! i want to post few more songs! u must have heard it obviously still i am sending vdo link..
we have lovely helen dancing on geeta’s song! its one of her hits in 60s………..
i hope u enjoy these songs! I did enjoy these songs! I was familiar with a couple of them (don’t like Main tere pyaar mein kya-kya), but of the ones I hadn’t heard before, the ones I especially loved were Na manogi fight karega and Tujhe doon main kya. Both fabulous – and such good examples of her versatility. 1955 again by M D ghulam mohd. at least i found these 2 tunes exact copy. Whew. You’ve really dug up a bunch of songs I hadn’t known. Except for Dharti se door and Bachna zara, I don’t recall hearing any of these before. Thanks. i am happy u liked it! This was new to me. Lovely song.